Figuuring out before an activity is designed and developed what the intended impact is. Focusing on outcomes more than outputs and working with community partners to determine what the impacts need to be. For example, a cohort 1 member sponsored community listening meetings at which she wanted to learn from the community what middle school youth need – What the gaps were in services to the age group in the community. The number of attendees at the meetings were not huge. However, the impact she was looking for was achieved, building relationships with caregivers and youth in order to begin to understand what services are needed. The entire Future Ready with the Library project centers on the competency of continuous learning. Those that are involved spend 12 months engaged in learning about their communities, learning about middle school youth, learning about outcomes and assessment and reflecting on challenges and opportunities as well as failures and successes. The Future Ready project works to help library staff working with middle schoolers gain skills in order to achieve success in their communities. Probably, if I asked members of cohort 1 and cohort 2 which of the Competencies they see their work related to, most of them would select each and every one of the competency categories. You can learn more about the project by reading blog posts from cohort 1 participants. 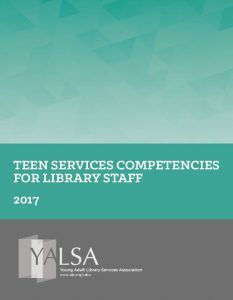 Don’t forget you can learn more about the Competencies on the YALSA website. Tagged Competencies, Future Ready, Future Ready with the Library.